I’ve been too busy recently to actually post anything new. I would not know when the next time I am available to write my next blog. Hopefully I have time to do a blog article before March but let see. If you do send me emails, I’ll surely reply but it may take some time. I was emailed a question lately and would like to share the solution to everyone. It’ll be a quick one. The original requirement was to print PDF with page breaks by every product type. The solution to that is just a few setups in Answers. Let’s use Sample Sales to do this example. Create an analysis report like the following. Create either a pivot table or table. I’ll use table as an example. 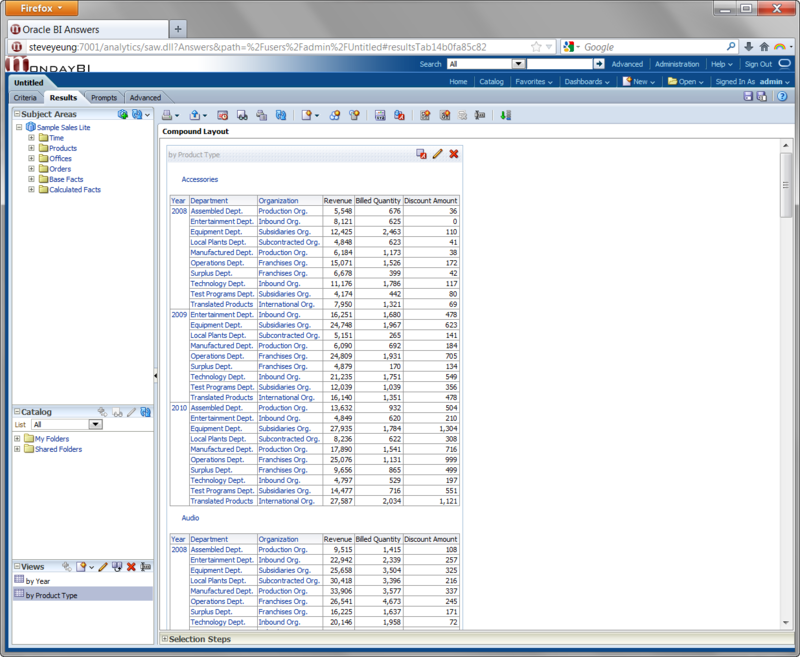 And when you edit the table, drag product type to Sections. 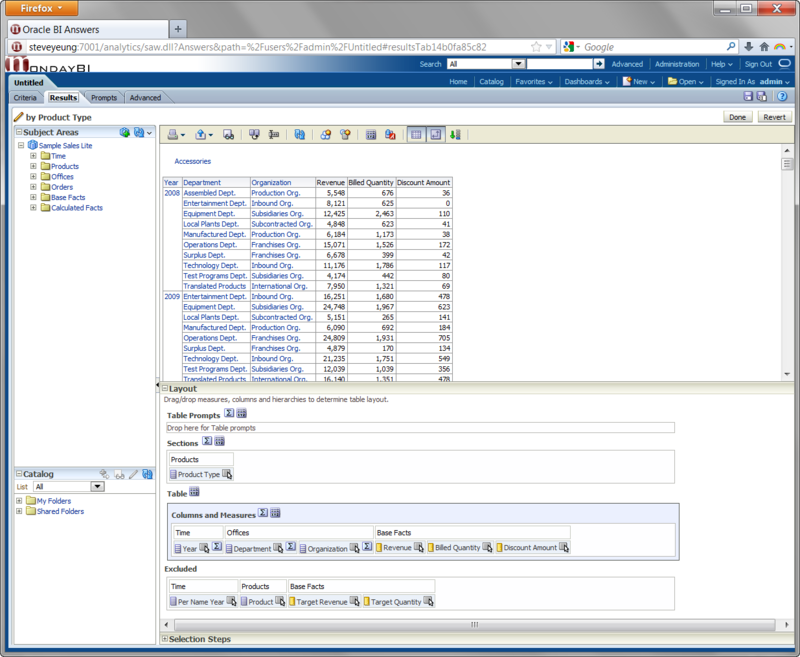 Then edit Section Properties. 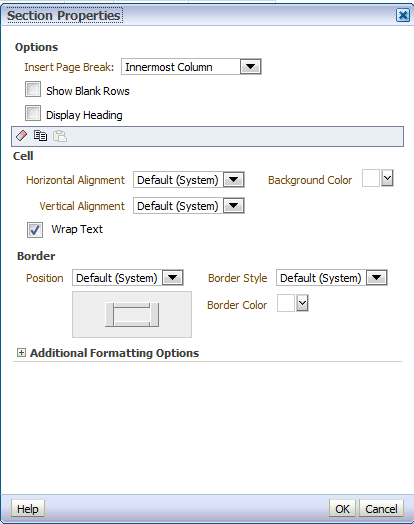 You will be able to see the first option called Insert Page Break! 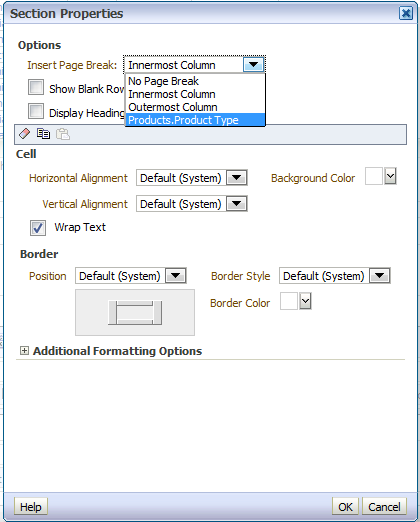 The drop down allows you to choose No Page Break, Innermost Column, Outermost Column or a specific column which in this case will only be Products.Product Type. No Page Break literally means no page break. Innermost Column would be the first column you have on your sections area. Outermost Column would be the last column you have on your sections area. Specific Column would contain all the possible columns for Page Break and you can only choose one. It does not matter which one you choose if you have only 1 column in the section area. When you have more than one, then you’ll need to give it some thought. Generally, I would choose the specific name in case I modify the sections area. If you need to combine 2 or more columns for the page break, you’ll have to concat these items in criteria before you use this feature. So this is what you will get in Answers. Click on Print button to print PDF. You can achieve the same by exporting to PDF. 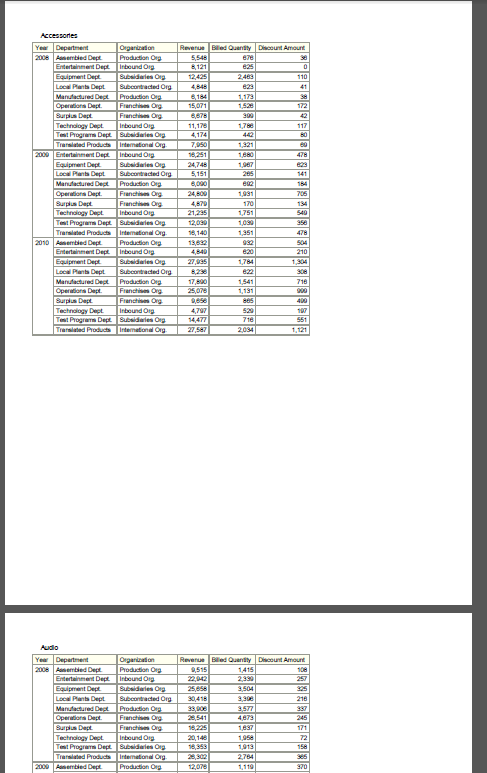 The result as follows, page break by product type in PDF! This would be great for scheduled email purposes using Agents. Too good not to reblog . . . Anybody who uses OBIEE on a daily basis knows just how frustrating it can be to properly format a document into .pdf format from an analysis. OBIEE formats excellently as a web-based tool, but when you want to get those analyses into a printable document, there are certain nuances that you have to be aware of. This blog post helps explain one of the ways to create better .pdfs for end users.